152 mm/50 Mk614 х 1 pcs. Initial HE Shell Velocity853 m./s. Initial AP Shell Velocity853 m./s. 76.2 mm/50 Mk4 A18 х 1 pcs. 7.6 mm Hotchkiss Mk18 х 1 pcs. Charleston — American promo premium Tier III cruiser. A St. Louis-class cruiser. A large ship with moderate speed, equipped with a big number of rapid-firing guns. The propulsion unit of the cruiser was protected with side armor. Like St. Louis, Charleston has the most health of any Tier III cruiser. A large arsenal of fourteen 152mm main guns combined with eighteen 76mm secondary guns. Turning circle of only 450 meters. Significantly slower rudder shift than that of the St. Louis top hull. Slot 1 provides two worthwhile upgrade options. Main Armaments Modification 1 ( ) is generally advised to improve the survivability of the guns. Some players may choose to mount Magazine Modification 1 ( ) to reduce the chance of a magazine detonation occurring. Charleston captains should mount standard signal flags to improve the ship's performance in battle. Sierra Mike ( ) flags are highly recommended to increase the ship's top speed. India X-Ray ( ) and Victor Lima ( ) flags can be mounted to improve the main battery's fire chance. 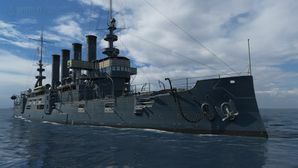 November Foxtrot ( ) and India Yankee ( ) flags can also be mounted to improve the ship's survivability. Lastly, economic and special signal flags can be mounted to increase the ship's economic gains per battle. The third USS Charleston (C-22/CA-19) was a United States Navy St. Louis-class protected cruiser. She was launched 23 January 1904 by Newport News Shipbuilding and Dry Dock Co., Newport News, Virginia, sponsored by Miss Helen Whaley Rhett, and commissioned on 17 October 1905, Captain Cameron McRae Winslow in command. She was reclassified CA-19 on 17 July 1920. USS Charleston (C-22), port view, undated. This page was last modified on 27 February 2019, at 21:50.